In Part 1 of this 4 part article I talked about the importance of being purposeful about your web/social media presence and the first step in that process is understanding who you are targeting. I shared that the more you know about the person (demographics) sitting behind the computer you want to target the more success you will have attracting that person through your internet strategy. I then wrote about the importance of knowing what’s going on in the head of the person about to do a web search – at that exact moment in time. Is he searching to make a purchase or is he doing research or could it be both? Today I will share with you why you should care. First and foremost you should care because you want your website to be a valued resource to potential customers. Why? 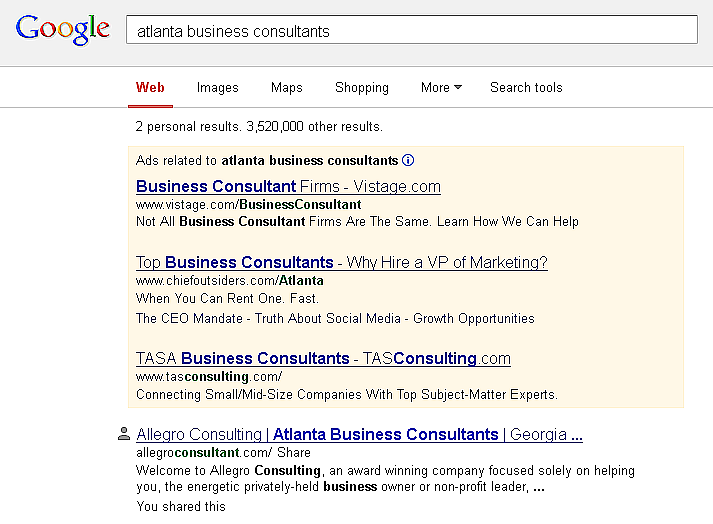 Simply put, because this translates to qualified leads. If that alone isn’t motivation enough then do it because Google and Bing (Microsoft) care. After all it is their mission to interpret what the customer has entered into their search window and send him to a site that best addresses those needs. You want Google to like your site because if they like you they move you to the front of the line. Number three had a CTR of 9.5 percent. Being number one in Google, according to Optify, is the equivalent of all the traffic going to the sites appearing in the second through fifth positions. 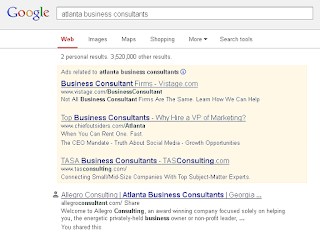 I am not qualified to tell you all the algorithms Google uses to evaluate your website and rank you but what I can tell you from personal experience (Allegro is the first site for “Atlanta Business Consultants”) is if your are genuine and sincere about being a valued resource for your target audience Google will reward you with higher ranking/placement. So how do you determine the content you should include in your website and what other social media outlets your company should spend time working on? I will answer that in Part 3 of this series on internet marketing basics. Whether you are the owner of a start-up or a well established business you are going to be challenged to make tough, agonizing decisions that will have a lasting impact. 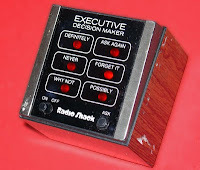 Decision making is part of the landscape of business. And in the true spirit of the immortal words "The buck stops here," the toughest decisions are reserved for you the owner. So how do you make these types of decision. First and foremost you use your strategic and tactical plan as a guide. A well vetted, market-based long and short-range plan is a very valuable tool for making tough business decisions. "Is it consistent with the plan?" is one of my favorite questions to ask owners struggling with a tough decision. But what if both or all the options are consistent with the plan. What then? There is something to be said about trusting your instinct and making decisions that way. If you have a lot of relevant experience from which these "instincts" originate then you are likely to make a pretty good decisions. But I am a data guy. Even with my depth of experience I feel more comfortable and confident when unemotional data is added to the decision process. What is the approximate cost (financial ($cash)) of each solution? Ballpark it. Rank the solutions by cost. Rank the solution by strategic impact. After compiling this data step away for a day or two. Now put your CEO hat on and look at the data as if a person on your staff is presenting these options to you for the very first time. 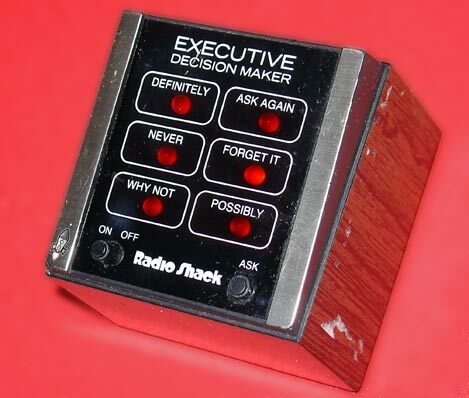 Make an executive decision. Document your rationale (On this date, I chose this course of action because.....). Proceed - and don't look back. Getting input from an advisory board for those decisions of strategic significance may also be prudent. But recognize, you and only you will be held accountable for the decision you ultimately make. There is a reason for the saying, "It's lonely at the top." Want some unbiased help exploring options and assessing impact of different strategies? We can help. Contact us here. The first coffee is on us.